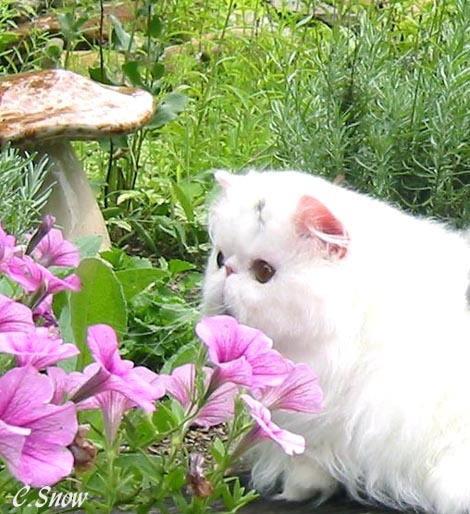 " Do not go where the path may lead, go instead where there is no path and leave a trail "
I have a small, private program of carefully selected, beautiful BiColor / Calico Persian cats. Occasionally I have a few kittens available to registered breeders and discriminate pet homes. As is the case with many small breeders, this is not a business but a "hobby", for lack of a better word, which is taken very seriously. This website designed for use with a 17 " monitor or larger. It is best viewed with a screen resolution of 1024 X 768. I am a " GREEN " Breeder, which means raising naturally is priority here. * To produce purebred Persians that come as close as possible to the written standard set forth by CFA through selective breeding practices. * To keep this program pure. There are no Himalayan or Exotic bloodlines within these pedigrees. * To raise in a natural manner true to the design of the feline mammal for optimal health. * To contribute a hardier Purebred Persian line to the breed. 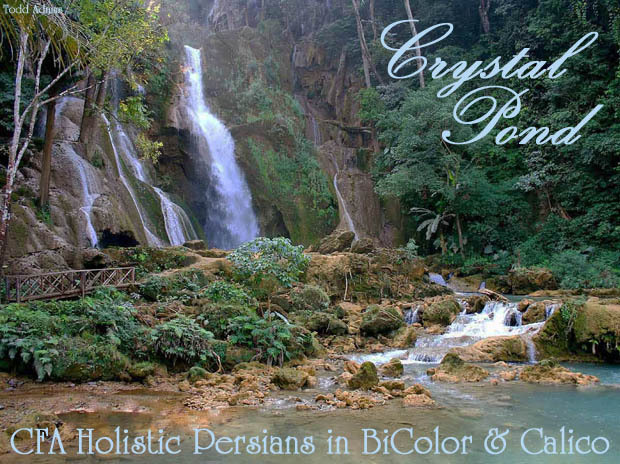 * To offer Persians of quality to breeders needing a hardy outcross for an infusion of health into their program as well as mentoring new natural breeders. 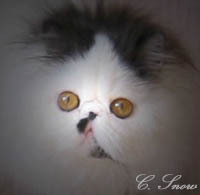 * To offer to the educated, health concious, discriminate pet owner, the option of a naturally raised purebred Persian. * To help educate adopters & the public on natural pet care. * Herbal and Homeopathic health care with the guidance of Holistic Veterinarians as well as through knowledge gained from my studies. * A species appropriate diet. * Natural forms of litter. * Bathing and Grooming with as natural an approach as possible. * Using only natural cleaning methods & strict husbandry. I have a fondness for many of the old lines........I find they are healthier and are becoming scarce in pedigrees today. I am not a fan of "doubling up" or breeding too close to "fix" type - health is more important to me......after all, what good is type if the health isn't there ? I love a sweet, open face, that is not so extreme that the nose is tiny and sunken in with slits for nostrils. There has to be a point when enough is enough. Ask yourself if you'd like to live with that nose. While I raise as naturally as possible, todays technology in the health care field is a valuable asset to a breeder. I love that I can incorporate modern technology into my holistic program. I get the best of both worlds. While many breeders do not allow their cats outside for fear of them catching something..... I do. Naturally they are out only on cool, dry days in an enclosed area when I am working in the yard. Preventive measures are taken with regards to insects and the likes. Cats, like every living thing, need the fresh air, sunshine, to feel the ground, run on the grass, etc. They are olfactory creatures and the smells of the outdoors invigorate them. You will find emotional well-being has a huge impact on physical well-being and allowing them to be who they are, enjoying the life they are entitled to - and designed for, will improve their health. A good immune system is built through exposure - to nature & life in general. Another reason to get the animals outdoors is that these days, our homes are very toxic with all the chemical cleaners, sprays, air fresheners, hair sprays, aerosols, chemicals in new rugs, the overuse of essential oils ( toxic to cats by the way ) to "freshen the air" etc. This certainly is a contributor to health issues. Spend more time outdoors in the fresh air and enjoy the life you were all given. Regularly air out your homes & find healthier, greener ways to clean and care for yourselves and your pets..
For the average person, you just cannot imagine entering into the Cat Fancy and what it takes to be a quality breeder. It truly is a whole new world, one you never knew existed. Everyone knows everyone - and who the responsible breeders are. As a breeder, your goal should be to protect, improve and preserve the breed - as well as educate those who adopt from you. You should certainly have a contract for each animal you place to protect their future and to protect the adopter as well as yourself. If you bring these animals into this world, you are responsible for their welfare and are to ensure, to the best of your ability, that whoever you place them with will provide the home they deserve. You should be supportive and available for assistance, to those who adopt from you. This is also an expensive endeavor - you'll get quite an eye opener in that area. It is quite alot more involved than just having a few cute babies to raise. I suggest some truly long, hard thought on the sacrifices, finances, necessary space, knowledge, and why you wish to become a breeder - are your motives ethical and do you really care about these animals ? You will be amazed at what you need to learn and the time you have to invest. It takes alot of commitment to study and husbandry so I suggest you start out with showing a cat in Premiership ( spay/neuter) and get a feel for everything first. Health & nutrition need to be your priority to have as healthy a program as possible - that should be your focus when starting out. After all, you have nothing without that foundation. You can be wiped out before you start if you do not study and educate yourself. You will also need to be able to prove to those whose cats you inquire about for your new program, that you are responsible and serious. As a breeder, you are expected to show your cats to have their quality judged to ensure you are breeding towards the standard. A quality animal is hard to come by, we don't just give them to anyone. Co - Ownership, some do this with all of their cats, to further protect the future and welfare of each cat they produce. It is commonplace for many of you to give up breeding within the first 5 years after a few bad experiences - and they will happen so be prepared and study all you can on disease, virus, healthcare, etc. The more prepared & educated you are before entering into a venture, the better your judgement & experiences will be. You cannot blame someone else for your lack of knowledge, uneducated choices and bad experiences. That is why I suggest you take your time, get educated and go slowly. Purebreds can be very hard to work with and on the flip side - it can also be very rewarding.